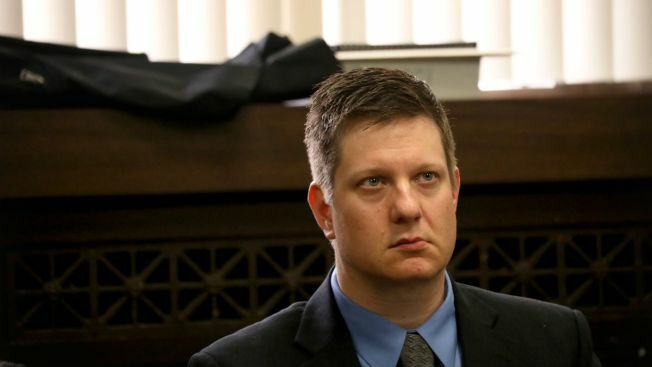 A Cook County judge on Thursday refused to throw out murder charges against Chicago Police officer Jason Van Dyke, the Chicago Sun-Times is reporting. Arguing to dismiss the indictment against Van Dyke, defense attorney Daniel Herbert argued the first-degree murder charge should be dropped, arguing that he had a “duty” to open fire on the knife-wielding McDonald. “(McDonald) was a forcible felon and he was fleeing arrest,” added Herbert, noting that police first encountered McDonald when they responded to a report the teen had been breaking into vehicles, and threatened a man with a knife. “Therefore the law … told police officers you can shoot ’em. Not only can you shoot ’em, it’s your duty to shoot ’em. You have to prevent the escape of this dangerous, armed individual,” Herbert said. “The last place Jason Van Dyke wanted to be on the night of Oct. 20, 2014, was at the scene of this shooting,” Herbert said during argument on a pair of motions to dismiss the 23-count indictment against his client. Herbert argued that political pressure forced former State’s Attorney Anita Alvarez to bring murder charges against Van Dyke as she faced public outcry over video showing the officer firing 16 shots into McDonald, even as Alvarez was facing a heated primary election. After losing her re-election bid to Kim Foxx, Alvarez turned the case over to a special prosecutor, Kane County State’s Attorney Joseph McMahon. Herbert also said grand jurors weren’t told about state law that allows police officers to use deadly force before handing up an indictment that included first-degree murder charges against Van Dyke, the first time in Illinois history, Herbert said, that a police officer had been charged with murder in an on-duty shooting. A half-dozen protesters gathered outside the courthouse entrance ahead of the hearing, and one man, wielding a bullhorn, spotted Van Dyke walking toward the front doors around 8:30 a.m. and followed him inside. Holding the bullhorn, the man shouted, “Don’t let that piece of s—t get off!” while standing near the doors, before deputies asked him to leave. The crowd in the courtroom gallery was larger than usual on Thursday. After early hearings in the case, Van Dyke’s appearances in court had more recently drawn only small contingents of demonstrators. Earlier this month, Van Dyke’s attorneys had complained that the officer and his father have faced a gantlet of protesters, and occasionally more ominous encounters, while coming and going from the courthouse. Security measures on Thursday seemed to reflect a “safety plan” created in response to repeated requests by Van Dyke to be allowed to stay home to avoid the crowds. Spectators were required to pass through a metal detector outside Gaughan’s courtroom even after making the usual trip through the security stations at the main entrance to the building. At least one person was told by a sheriff’s deputy to close their coat, in order to cover a slogan on their T-shirt, before entering the courtroom. Extra deputies were stationed around the courtroom during the hearing. As at most hearings, Van Dyke sat beside his father in the front row of the courtroom gallery, his gaze pointedly facing forward, away from the crowd behind him. As at other hearings in the case, Gaughan addressed the assembled lawyers for a brief discussion of motions before moving the hearing in chambers. The judge and lawyers spent about 20 minutes in chambers, before returning to the courtroom.